Indian Prime Minister Narendra Modi’s whirlwind tour this month of the five Central Asian republics of Uzbekistan, Kazakhstan, Turkeminstan, Kyrgyzstan and Tajikistan, with a stop in the middle in Russia, was a move to breathe life into the “Connect Central Asia” strategy launched under Modi’s predecessor, Manmohan Singh, in 2012. Modi’s renewed seriousness about an Indian foreign policy that looks north is underscored by India’s investment in the Iranian port of Chahbahar. The port forms the southern end of the International North-South Corridor (INSTC), a multination rail, road and shipping network connecting India with Russia via Central Asia. But this key piece in India’s plans also reveals New Delhi’s dependence on Iran in achieving its goals in Central Asia. India wants to expand that trade corridor as a gateway to Central Asia and Russia, bypassing Pakistan. To do so, India plans to link the INSTC with other projects in the region, such as the 2011 Ashgabat Agreement to develop a transit corridor initially connecting Uzbekistan, Iran, Turkmenistan and Oman. The agreement has since expanded to include Kazakhstan and, perhaps in the near future, India, which has expressed interest in joining. India wants to emerge as an alternative market for Central Asia, even as China looks to cement its economic primacy in the region via its massive, so-called One Belt One Road infrastucture and trade initiative in Eurasia. India’s engagement in Central Asia is also aimed at strengthening multilateral security ties, as evidenced by India’s pending entry into the Shanghai Cooperation Organization (SCO) at a time when new unrest in Afghanistan is stoking more Islamic terrorism and drug trafficking. Uzbekistan, the most populous of the Central Asian republics and a country that sees itself as a natural leader in the region, was Modi’s first stop. 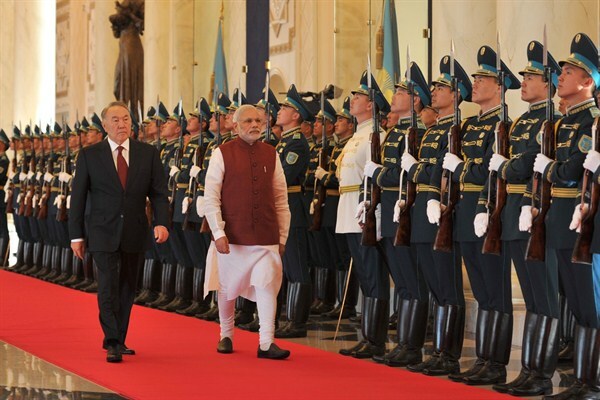 Modi stressed that beginning his journey in Uzbekistan “underlined its importance for India, not just in the context of this region, but also more broadly in Asia.” Symbolism aside, India and Uzbekistan realize they need to add economic depth to their strategic partnership. Discussions during the visit focused on removing hurdles to Indian investment in Uzbekistan’s agriculture and energy sectors that could increase related exports to India. Uzbekistan is already India’s main counterterrorism partner in the region; closer intelligence cooperation on the Taliban and Pakistan, as well as on new players entering Afghanistan like the self-declared Islamic State, is on the table. Maritime Silk Road (MSR) that will connect China and Southeast Asian countries, Africa and Europe. OBOR’s grand vision seems to cover every continent except the Americas. It is aimed at further strengthening the Chinese role in economic integration with these nations and playing a larger role in global political affairs. As and when the infrastructure is ready, the Chinese are not only looking to push its indigenous technologies but also find means to export its surplus manufacturing. KARACHI — Paramilitary forces raided the headquarters of a powerful Karachi political party and arrested two members on Friday, officials said, in a sign of deepening tensions between the army and politicians controlling the biggest and richest city. Many fear the showdown may threaten the stability of the financial hub that generates half of government revenue and is home to 20 million people, or upset the delicate balance between the fledgling civilian government and the powerful military, which has a history of coups. The paramilitary Sindh Rangers, which fall under military command, said they raided the Muttahida Qaumi Movement (MQM) because the party had been making hate speech. The MQM, Pakistan’s fourth largest party, traditionally represents the descendents of Urdu-speakers who migrated from India after the creation of Pakistan in 1947. It was involved in bloody factional battles in Karachi in the 1990s and now holds the majority of the city’s legislative seats. Iran and world powers finally clenched a long awaited nuclear deal earlier this week. As The Diplomat‘s Ankit Panda points out, the deal is written quite well, enough to ensure Iranian compliance because sanctions can easily be reimposed if Iran cheats. In any case, it is highly unlikely that Iran will cheat, or cheat too explicitly. Why would Iran do so anyhow? Iran’s leaders agreed to negotiations because they are rational actors–contrary to what some American politicians believe–who value the survival of their governmental system and the national’s welfare enough to negotiate. Therefore, it is highly unlikely that Iran will take actions that explicitly violate the terms of the nuclear deal. The deal fits broadly with Iran’s goals of expanding its influence in the Middle East because it helps Iran’s economy and ends its political isolation, which would speed up its reintegration into the global system, giving it both the power and respect that Iran has always craved. Moreover, other Asian powers like Russia, India, and China are all happy with the deal; this could in fact mark the moment, along with recent developments with the Asian Infrastructure Investment Bank (AIIB) and Shanghai Cooperation Organization (SCO) that a new Asian multilateral order emerged in a quadrangle formation with four major civilizational hubs (Russia, China, India, and Iran). Are the Kyrgyz Who Join ISIS Mostly Uzbeks? 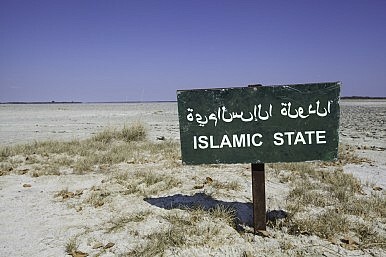 More than 70 percent of the Kyrgyz that have gone to join ISIS are of Uzbek descent, Ryspek Abdysatarov, a representative of Kyrgyzstan’s Secretariat of the Council of Defense, said at a recent roundtable on security in Central Asia. 24.kg reported that Abdysatarov said there could be as many as a thousand Kyrgyz who have gone to Syria — the Kyrgyz Interior Ministry’s Antiterrorism department says 352 and an International Crisis Group report earlier this year estimated between 2,000 and 4,000 from all five Central Asian states. Numbers are decidedly disputed and estimates vary, quite widely sometimes. 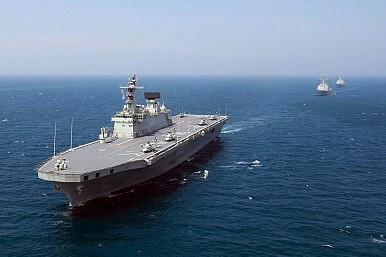 Recent tensions in East Asia have led to debates across the region about strategic relationships with both China and Japan. There has been little similar debate in Europe, but some are calling for the U.K. to engage in greater security cooperation with Japan. Given the U.K.’s reduced military capacity and its commitments elsewhere, an enhanced security relationship would have little material impact, but would be politically symbolic in the region. This is precisely why Britain should respond cautiously, in spite of the long-standing close ties between London and Tokyo. 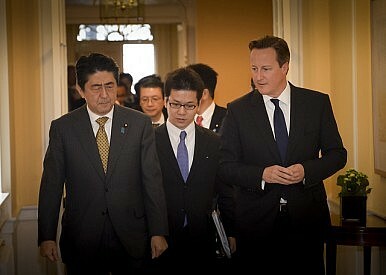 Arguments for strengthening the U.K.-Japan relationship range from claims of shared political values, the potential for collaboration in military technology or the coordination of overseas development assistance, and the existence of shared security challenges. For some in Japan, the recent execution of Japanese hostages by the Islamic State has reinforced the case for a more assertive and outward-looking security policy. Others invoke memories of the 1902 Anglo-Japanese Alliance, and a sentimental affinity between these two island kingdoms. Modi in Central Asia: Goodbye TAPI, Hello TII? Before he set out on one of the most substantive tripsthrough Central Asia any Indian official has yet known, Indian Prime Minister Narendra Modi landed a handful of desired outcomes. 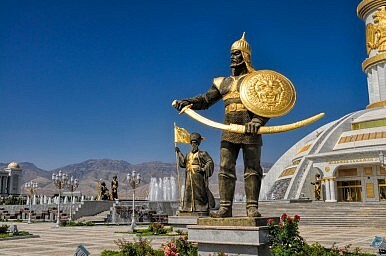 He accrued further resource agreements with Kazakhstan, and discernibly improved relations with Bishkek and Dushanbe. He even opened a yoga center in Turkmenistan. However, it appears that Modi was unable to finalize one project both New Delhi and Washington have desired for years: a firm start-date for the Turkmenistan-Afghanistan-Pakistan-India (TAPI) pipeline. While Modi and Turkmenistan President Gurbanguly Berdymukhamedov made all the right gestures, said all the right things – Berdymukhamedov noted they were on the “threshold” of the project – the visit ended heavy on rhetoric, light on action. At this point, highlighting disappointments surrounding TAPI is akin to beat a dead horse; the refrain has grown old. And coming on revelations that Gazprom has failed to pay any of its 2015 gas bills to Turkmenistan, rumored to be upwards of $400 million, the lack of movement on TAPI may well have been doubly disappointing for a Turkmenistani government looking to buck Beijing’s stranglehold on Turkmenistan’s gas exports. Chinese-government linked hackers are using American computer services companies in conducting cyber attacks against private company networks, according to cyber security analysts. A detailed computer forensic investigation by a major U.S. security firm revealed that three recent cyber attacks were carried out by two Chinese hacker groups known as Deep Panda and Wekby. Both groups appear linked to each other and are part of a Chinese-government run cyber espionage campaign. The Department of Homeland Security stated in an internal report that cyber espionage targeting the bulk collection of personal data from government and private networks included nine attacks over the past year. 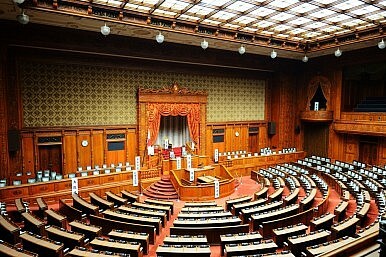 On July 16, Japan’s lower house approved security legislation backed by Prime Minister Shinzo Abe, a step toward codifying one of the largest shifts in Japan’s security posture since the end of World War II (for more, see: “Japan’s New Security Legislation: A Missed Opportunity”). Most notably, the legislation will permit Japan’s Self Defense Forces to engage in collective self-defense. Predictably, the bills (which still need to be approved by Japan’s upper house) have sparked a strong reaction from neighboring China, which remains on hyper-alert for any sign that Japan is seeking to remilitarize. China’s Ministry of Environmental Protection (MEP) is on a roll, pushing out action plans, regulations, and laws to address a number of its most pressing environmental challenges. 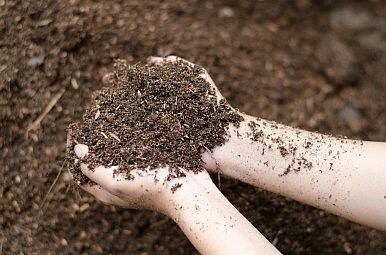 Most recently, in mid-July it announced that it had submitted an action plan to the State Council to tackle one of the country’s least visible but most serious problems: soil contamination. Plans are also in the works for a new soil pollution prevention law in 2017. 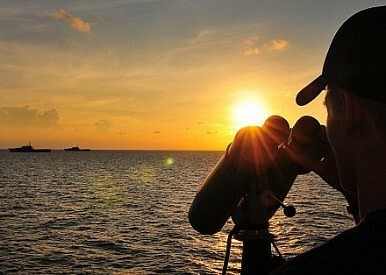 The Philippines is now reinforcing the hull and deck of the ship, according to Reuters, using small fishing boats to slip “cement, steel, cabling, and welding equipment” past watchful Chinese coastguard vessels. 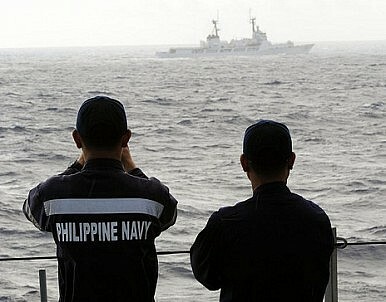 Officers who have visited the vessel portrayed the work as merely trying to maintain the ship’s current state. “We know China has been waiting for the ship to disintegrate but we are doing everything to hold it together,” one officer toldReuters. The South China Sea is a litmus test for South Korean grand strategy, which would benefit greatly by reorienting away from an inward obsession with North Korea and instead turning outward, to attend to the destabilizing trends in its neighborhood. Korea’s history is one of victimization at the hands of great power competition; avoiding that fate should be its raison d’etre. For those unaware, this article is part three in an ongoing debate with Robert Kelly, a professor at Pusan National University (and a friend by proxy). The first part was an argument I advanced last month, stating that South Korea should not remain silent about aggression in the South China Sea. Kelly’s response, over at The Interpreter, was a smart explanation of the status quo in South Korea, concluding that it’s in South Korea’s—and the region’s—interest for it to stay mum on the South China Sea. I have minor quibbles with a few of Kelly’s supporting points, but the biggest source of debate between us may be an implied one, about the type of grand strategy that would best serve South Korea. The gate stands tall outside the municipal court. It’s 7:30 a.m. but the petitioners in front of the court have already gathered with banners urging officials to handle their cases. These petitioners – you can see them in most Chinese cities, also lobbying city hall and the public security bureau – want redress for family disputes, government land grabs, and other grievances. Their shared goal is to get the court to re-investigate their cases. ​​​The commotion described above is not a revolt against the CCP, but a process that is a part of the state-recognized petitions system, or Xinfang (信访). As Tyler Roney has explained in The Diplomat, Xinfang draws its historical roots from China’s imperial past. Xinfang departments exist in all government bureaucracies, to answer citizens’ complaints – or at least that is what they are supposed to do. But Xinfang is seriously underfunded, lacks any real power, and is seen as a “career black hole.” To be put in the Xinfang entails the thankless task of appeasing the populace while defending CCP rule. The relative powerlessness, combined with the often messy “reception” halls makes it one of the most dreaded posts in the bureaucracy. “The main indicators show signs of recovery and the trend is improving,” China’s National Bureau of Statistics (NBS) spokesman Shen Laiyun said in a statement. The U.K.’s Royal Air Force has been among the most active in bombing Islamic State targets in Iraq in recent months. Prime Minister David Cameron’s government is considering whether to hold a parliamentary vote on extending the airstrikes to Syria. Mr. Fallon said the U.K. contribution went beyond strikes in Iraq from Tornado combat jets and Reaper drones to a range of airborne intelligence collection planes patrolling the skies of the Middle East. Among the systems being used to find Islamic State targets is the relatively new Airseeker signals intelligence plane, first delivered to the RAF by L-3 Communications Holdings Inc. in late 2013. With the Iran deal, Tehran will be looking to purchase arms. Who’s selling? The recent deal between the P5+1 and Iran over the latter’s nuclear program means, reportedly, that Iran will once again be on the market for advanced weapons technology, and that (eventually) it will have money to spend. 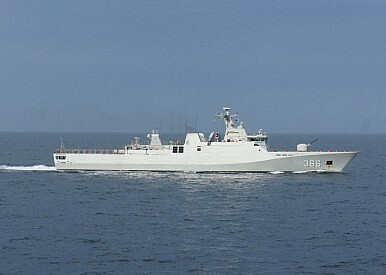 There is little question that both Russia and China have been looking forward to this moment. Indeed, Russian and Chinese forebearance has been one of the miracles of the sanctions process, evidence that neither, however much they like to tweak the United States, actually favors a nuclear Iran. But even if the deal fails to make its way through the U.S. and Iranian diplomatic process, the arms embargo has a very limited lifespan. The Post-Iran Deal Mystery: What Will Khamenei Do? We need to keep an eye on Khamenei. He can’t simultaneously be in favor of backing Rouhani’s call for moderation and stick to the old ways of the Islamic Republic. 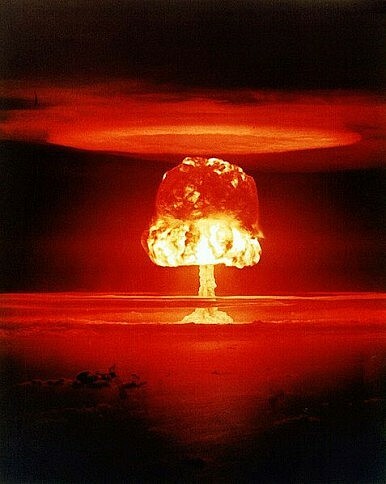 The American public remains justifiably anxious about Iran’s nuclear program. No one in Washington expects that the nuclear agreement announced on July 14 will be a quick fix to thirty-six years of bad blood between Washington and Tehran. But polls show a plurality of Americans still support diplomacy with Iran over military confrontation. If I were sitting in Tehran, I would zoom on this twist as a timely opportunity. On the other hand, the American side should not expect any big policy U-turns, but encourage Iranian moderation whenever possible. This is what both sides need to do to make the nuclear deal survive the Obama presidency. Ensuring security from external aggression is a basic public good that the governments have to provide and given that it is not possible to reveal individual preferences, this has to be financed from taxes. The important issue confronted by the policymakers, however, is the basic economic dilemma of scarcity and choice. The funds allocated for defence are not available for spending on physical infrastructure or human development which are necessary to improve the living conditions of people. As stated by David Greenwood, “What the budgeting system should ideally do is to ensure that the ‘right’ amount is spent on defence in the light of pattern of national priorities, and the ‘right’ military capabilities developed in the light of the structure of security priorities” The answers to what the “right” amount is depends on the economic choices the government has to exercise in providing various public goods, merit goods and services, given the overall resource envelope. A secret U.S. intelligence assessment predicts that Iran’s government will pump most of an expected $100-billion windfall from the lifting of international sanctions into the country’s flagging economy and won’t significantly boost funding for militant groups it supports in the Middle East. Intelligence analysts concluded that even if Tehran increased support for Hezbollah commanders in Lebanon, Houthi rebels in Yemen or President Bashar Assad’s embattled government in Syria, the extra cash is unlikely to tip the balance of power in the world’s most volatile region, according to two U.S. officials who spoke on condition of anonymity to discuss the intelligence document. The controversial CIA report, on which key members of Congress have been briefed, provides ammunition to both sides in the battle brewing on Capitol Hill over what White House aides call President Obama’s signature foreign policy achievement, a sweeping multinational agreement that aims to block Iran’s ability to build nuclear weapons for at least a decade in exchange for the easing of sanctions that have hobbled its economy. Under the deal sealed Tuesday in Vienna, once Iran completes a series of strict requirements, the U.S., the European Union and the United Nations will suspend the most damaging sanctions against Iran’s financial and energy sectors, and Tehran will be given access to about $100 billion from oil revenue frozen in overseas accounts. That could occur early next year. “When you drop a bomb from a drone … you are going to cause more damage than you are going to cause good,” said retired three-star general Michael Flynn, who ran the Defense Intelligence Agency from July 2012 through August 2014, in an interview with Al Jazeera English’s “Head to Head” set to air July 31. “I think as an overarching strategy, it’s a failed strategy,” the senior intelligence officer said. As BRICS leaders met in Ufa, Russia, for their annual meeting recently, there were expectations and anxieties galore. The group met as tensions between Russia and NATO rose, Europe's circus of the absurd (the Greece crisis) continued, impending global agreements on sustainable development and climate action were being negotiated, and celebrations for the 70th anniversary of the UN approached in New York. All of this at a time when the liberal international order was shown to be inept at managing radicalism, barbarism, parochialism and illiberalism across the world. The BRICS member states are also experiencing their own specific political moments. Russia is struggling to cope up with the dynamics of the energy sector economy and is involved in an intractable conflict in its neighborhood. Brazil seems to have lost the 'Lula mojo' and is fighting economic and political inner demons. South Africa and its enthusiasm for being the gateway to Africa has suffered a body blow with reports of a series of fatal attacks on African migrants. India is pre-occupied with rewriting its story under the tireless outreach of Prime Minister Modi, who is exclusively focused on reshaping India's economic trajectory. And then there is China, which is putting together the plans and institutions that might soon constitute the 'Beijing Consensus' that could dominate the geo-economic landscape over the next few decades. In his press conference on Wednesday, President Obama said that his deal with Iran is the best outcome that could be achieved. History proves otherwise. Unlike past successful non-proliferation efforts with respect to states seeking nuclear weapons, this deal moves Iran further down the path toward obtaining a nuclear weapon. Indeed, the deal actually recognizes Iran’s "right" to enrich uranium and Iran will keep at least five thousand nuclear centrifuges spinning into the future. Six previous United Nations Security Council Resolutions stated the opposite. Iran flouted those resolutions and is now being rewarded for its clandestine and illegal nuclear enrichment activity. When South Africa, for example, ended its nuclear weapons program in 1992, it not only dismantled its weapons stockpile, the country completely shut down its entire nuclear weapons program under IAEA supervision. When Libya came clean on its weapons of mass destruction program, it turned over every scrap of illegal material and dismantled its weapons making infrastructure. Not so here. Iran will keep the Fordow bunker “for nuclear research.” It will keep its Arak reactor (albeit, modified) and all other illicit sites it developed to build an atom bomb. South Africa and Libya were non-proliferation success stories. This Iran deal is not. "Loudly attacking Russia at every turn may be good politics for some, but it is bad and dangerous policy for Georgia." Georgia’s foreign and security policy is frequently talked about in “planetary terms.” For example, the statement that Georgia might enter “Russia’s orbit” like a “satellite” is a common expression; as a comet, Georgia is expected to follow a western trajectory. If so, Georgia—like a meteor—may find itself on “a collision course” with Moscow. In a recent article published by the Washington Post, the fear of entering Russia’s orbit was expressed. Speaking in cosmological terms, Georgia’s people, institutions and governments are expected to enthusiastically proclaim allegiance to the West and—with a single breath—denounce Russia. Most recently, a National Democratic Institute opinion poll indicated that 26 percent of Georgians prefer the Eurasian Union over the EU. Out of context, there was one more “Russian orbit” interpretation, but this poll wonderfully captured the false choice that is being presented to Georgia from the outside. Georgia is not a celestial body. Grounded in the South Caucasus, Georgia has specific neighbors, political, economic, financial and military limitations. Thousands of Georgians receive remittances from Russia and trade in Russia. For generations, the mark of the elite was how “hallo” was pronounced when picking up the phone, which gave away how much time one had spent in Moscow. It took a historic deal with Iran to drive news from the European Union off the top of the past few days’ news feeds. In any other week, the continued saga of the eurozone and the latest deal with Greece would have received even more attention than it did. The news from Vienna was dramatic, but what happens in Europe over the next few years will be a lot more important than the ultimate outcome of the nuclear deal with Iran, as significant as that achievement is. Remember: Iran is a country of some 80 million people, but the EU is a supranational community with a population of more than half a billion. As an economic unit, the EU has a combined GNP larger than that of the United States, considerable wealth, advanced industries, and significant military potential. The United States is formally allied with most of its members and has long benefited from cooperation with its fellow democracies there. Europe’s future course is therefore of considerable interest to the United States. Private polling shows Jeremy Corbyn ahead in the first round of voting, a survey seen by the New Statesman has revealed. The veteran leftwinger has surprised observers by collecting 40 nominationsfrom local parties, just eight less than the bookmakers' favourite, Andy Burnham. Yvette Cooper has 30. Liz Kendall is way back in fourth place with just five. But the pattern of nominations actually underestimates Corbyn's strength among the membership if two seperate polls are to be believed. The surveys, conducted on behalf of Corbyn's opponents, are bleak news for Corbyn's rivals. If vote share and constituency nominations mirrored each other, Burnham would be ahead of the pack with 39 per cent, Corbyn would be second with 33 per cent, Cooper third with 25 per cent, and Kendall fourth with four per cent. However, it appears that Labour's preferential voting system - used both for the final contest and to nominate by local parties - is masking Corbyn's strength in the first round. One survey has Corbyn ahead by more than 15 points. Another puts him in what one campaign staffer called "a commanding position...he is on course to win". During the late 1980s, American and Iranian naval forces repeatedly skirmished in the Persian Gulf. Media coverage speculated that the fighting could escalate into a full-fledged conflict between the U.S. and Iran. The U.S. destroyed an Iranian frigate and crippled another one during the largest of such clashes in 1988, but it didn’t escalate into a wider war. The skirmishes were a side-effect of the eight-year-long Iran-Iraq War — and the so-called “tanker war” when both Baghdad and Tehran attacked shipping in the Persian Gulf. Those tense days might have been the closest Washington and Tehran ever came to crossing the Rubicon. But nearly a decade later, the Clinton administration came close — perhaps even closer. On June 25, 1996, a truck bomb ripped through the Khobar Towers complex in eastern Saudi Arabia — killing 19 American airmen. U.S. intelligence agencies blamed Iranian proxy forces for the bombing. SEOUL, July 16 (UPI) – South Korean lawyers are demanding answers from Seoul’s spy agency after WikiLeaks posted a Twitter message claiming lawyers’ computers were hacked. 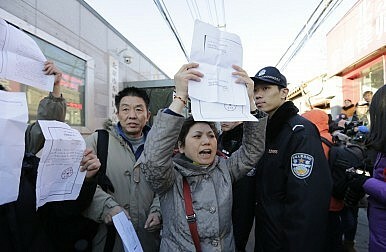 The Korean Bar Association requested an investigation on Thursday, South Korean newspaper Hankook Ilbo reported. The group of lawyers issued a statement claiming the National Intelligence Service was in violation of Korea’s Communications Privacy Act when it used a program from Italian firm Hacking Team to spy on lawyers. “Investigators should carefully look into the hacking’s agency and purpose, and mete out severe punishment to those responsible,” the statement read. The Korean Bar Association said the hacking could retrieve conversations on mobile phones, transmitted content and photos. Real-time surveillance also was possible, the group said. South Korean newspaper Munhwa Ilbo reported a senior official at the intelligence agency denied the WikiLeaks claim, which was posted on Twitter on Tuesday. In fact, the nature of the discourse in the Diet that unfolded after June 4 was almost a flashback of the two previous Diet debates, one during and after the 1991 Persian Gulf War and the other in the aftermath of the 9/11 terrorist attacks. In both cases, the debate almost solely focused on the legal aspect — constitutionality, in particular — of the legislation proposed by the government to authorize a certain action by the Japanese government. 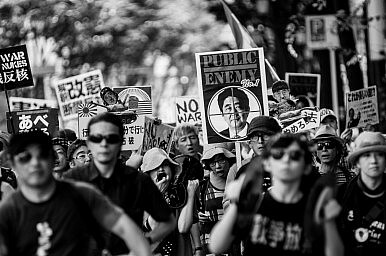 In both cases, there was little, if any, debate about whether the response proposed by the government was in Japan’s national security interest, or whether the proposed legislation provided the Japanese government with sufficient tools to address the security challenges under discussion. 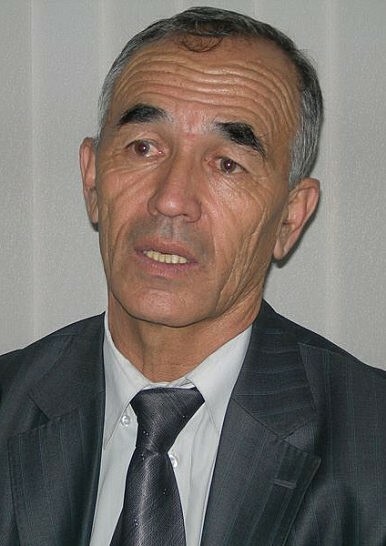 In 2002, Askarov founded Vozduh, a group aimed at monitoring the conditions of Kyrgyz prisons, which are routinely criticized for torture. When the violence broke out in 2010, Askarov photographed and filmed some it in his hometown. The Kyrgyz state says he participated in organizing the violence, Askarov maintains his innocence. Most of those killed during the June 2010 violence were ethnic Uzbeks, as were most of those convicted of crimes relating to the violence. The five year anniversary passed last month and though violence has not returned, tensions remain and rumors abound. Having just read the joint CSIS-ANU 'audit' of the U.S. alliance, published this week, a few of us here in Australia wondered whether the Australian public would support the sort of intensified alliance proposed by the report's authors. It has been said that the finer points of foreign policy don't decide elections here in Australia. So, does it even matter what the great unwashed thinks about the alliance? As one commentator has pointed out, “the last mainstream Australian politician to openly criticize United States policy was Mark Latham, and look what happened to him at the ballot box.” The unpopularity of Australia's participation with its alliance partner in the Iraq war must have contributed to some degree to the Howard government loss in 2007. So, perhaps one shouldn't blithely dismiss the relevance of public opinion on foreign policy generally, and the U.S. alliance in particular. 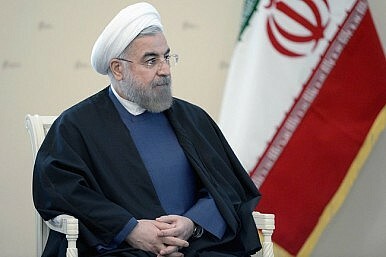 Moscow's Iran Man: Why Is He Smiling? Russia has little to celebrate in the new Iran deal. Ever since the Russian invasion of Ukraine, relations with the United States and Europe have gotten increasingly tense. Russia’s sending bombers to test European and American defenses. The Europeans are standing by sanctions. So it’s more than a little peculiar to see Russian deputy foreign minister Sergei Ryabkov, who was the principal day-to-day negotiator, broadly smiling about the Iran agreement in the above photo (taken by Al Monitor journalist Laura Rozen). Does he know something the rest of us don’t? For a number of reasons an agreement between Iran and the West does not immediately appear to be in Moscow’s own interests. Quite the contrary. Consider the impact on oil. Already the unexpected plunge in oil prices, coupled with sanctions, has put more than a minor dent in the Russian economy, which is overly reliant on black gold to fund Russian president Vladimir Putin’s lavish social-welfare commitments as well as his ambitious military-modernization plans. The Iran agreement has already begun to effect a further diminution in prices—predictions are that by summer’s end American motorists will be see gasoline at $2 a gallon. The Islamic Republic of Iran boasts the world’s fourth-largest oil reserves, second-largest gas reserves and the 29th-biggest economy, estimated at US$415.3 billion in 2014. Its gross domestic product is growing about 3% a year despite the crippling impact of decades-old sanctions. Not surprisingly, then, potential economic gains are prevailing over military, terrorism and human rights concerns in shaping responses to the historic deal agreed to this week between Iran and six major world powers (P5+1). While Iran trails Saudi Arabia as the biggest economy in the region thanks to the latter’s energy dominance, it has many advantages over its rival that are sure to become more pronounced as sanctions are lifted. Iran’s economy is more diversified and includes a robust manufacturing sector that supplies domestic and Asian markets with chemicals, plastics, automobiles and household electronics.